Cooking containers There are 3 products. The JOCCA Spice Rack is a great decoration element for your kitchen. It includes 4 glass jars to store the condiments fresh and nitty and the stainless steel lids guarantee a great conservation. 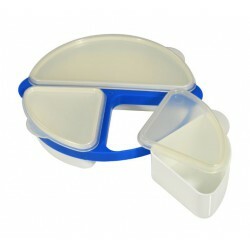 The JOCCA Thermal Lunch Container is ideal for using as a lunchbox. With 3 different containers on the inside, you will be able to save the food fresh and warm until you eat it. Including a fork and a spoon, the JOCCA Lunch Container is perfect for your kid meal or a long day outside. Menaje de cocina. Una amplia gama de recipientes de cocina con los mayores descuentos, menaje de cocina al mejor precio.